thanks you so much for that nice stay. Wonderful staff! xoxo to the Long-term residents too :D I had a great stay! I stayed in this Hostel twice now and it is definitely my favorite place. You feel very comfortable and the free dinner opportunity every day is great! Best hostel I've been to. Cool place! Fun crowd. Free dinner everyday! Nice neighborhood. I loved it. We booked last minute after the Air B'n'B we actually wanted to stay in was filthy. The staff was really friendly and showed us around. The bathroom is really (really) tiny, but it's alright for two, especially because we were out and about all day long. We were offered two towels, of which one had a brownish stain on it - the was kinda gross, but something like that can always happen. Bear in mind that the walls are pretty thin, but there are earplugs at the reception. it was a lovely stay! the stuff was super nice and willing to help and relaxed. the femal beddorm was good and we had lokers to secure our stuff. bathroom was a little small and the showers weren't as comfy, but thy did theire duty. location was awesome! near the underground station, lots of pubs and little restorants around and just sweet for a little walk. I would definitely recomment. Nice hostel, with a very nice atmosphere and a bunch of great people - working as well as visiting! The free dinners in the evening are always delicious and a great opportunity to get in touch with others. Staff is nice and very helpful, common rooms are bright and well furnished, dorms are simple but adequate. I had a blast staying there and will come back for sure! One of the nicest Hostels I've been to. Very easy to socialize and amazing staff! The bathroom was ridiculously small and the room semi clean but I would still highly recommend this hostel due to the amazing time I've had. 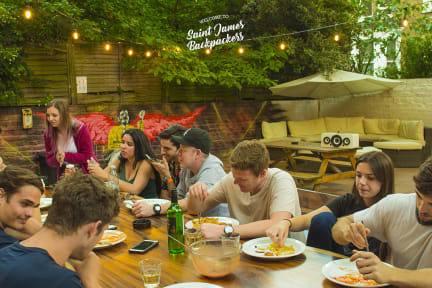 Free breakfast and dinner as well as the amazing location 2 min from the tube Earl's Court with bars and shops around the corner makes this hostel the best possible value for your money! GO THERE! The room was nice, breakfast was okay and the staff was friendly and helpful. It is easy to find and an underground Station (Earls Court) is nearby. Sometimes there is a cat walking around, which is good to know if you've got allergies.